The Brotherhood Of The Circle is an independent corporate entity focused on actions dedicated to education and support of Dominant male heads of households loyal to the ideal of male lead families. Through the combined knowledge and talents of its membership, the Brotherhood is in a position to gather and disseminate valuable information pertaining to this family model. Beyond this simple concept is the opportunity for each member to expand the range of his awareness and individual methodologies. At the same time, men further educate and inform one another on many additional fronts. The provision for peer interaction, support and education, within the realm of our chosen lifestyle, is paramount to our purpose. Critical to any formula-for-success, is a leader’s ability to provide the best possible life for his family. To this end, another major goal of this organization is to help enrich the lives and bank accounts of its members. We seek out, exchange or share functional and informational resources, important of the concept of a sovereign independence. This critical element is affected through real-time interactions, investments in various business ventures, securities trading and other financial vehicles, while at the same time applying a specific code of behavior to our function as individuals and as a group. 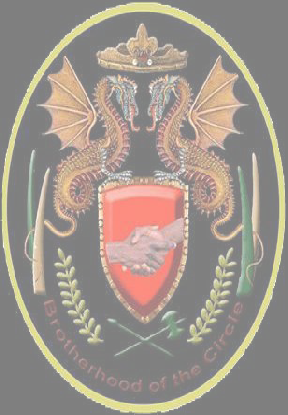 The Brotherhood Of The Circle consists of men who value self-distinguishing integrity above other considerations. One method of assuring this unwavering guideline is to adhere to a drug and substance free policy within our membership. We randomly screen our members for substance abuse and/or drug use. Households hewn in the 1950's models are the standard for our own. A deep commitment to personal honor and integrity compels our pledge to accept our responsibilities as moral and behavioral examples of the sovereign family leader, honestly and with real purpose.